The purchase of the Wessex 31A helicopter for the RAN came about because of Australian Government plans to disband the Fleet Air Arm. This was announced in 1959 when it became obvious that the Sea Venom jet fighter and Gannet anti-submarine warfare (ASW) aircraft would reach the end of their usable life in 1963. The worsening political and military situation in Southeast Asia with a rising and unpredictable Indonesia, open conflict in Indo China and growing Soviet involvement in the area however meant that the aircraft carrier Melbourne needed to be retained as an ASW carrier. Thus the RAN ordered 27 Wessex 31A ASW helicopters, which began to be delivered in September 1962. The Wessex was powered by a single Mk 162 1540 shaft horse power Napier Gazelle free-turbine engine, capable of a range of about 260 nautical miles and a speed of 108 knots. The crew consisted of a pilot and co-pilot and two positions in the rear cabin for the ‘dunking’ sonar and electronics operators. With its folding tail and rotor blades the Wessex fitted easily into Melbourne’s hangar deck. 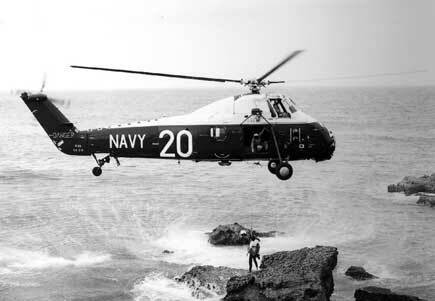 The Wessex had been developed from the Sikorsky S-58 and built under licence by Westland Aircraft Ltd at Yeovil in the United Kingdom for the Royal Navy. The helicopter entered Royal Navy service in 1961 as both an ASW aircraft and as a troop carrier for the Royal Marines. The Royal Air Force also used it as their main transport helicopter for many decades. Besides its ‘dunking sonar’ the Wessex could carry long-range fuels tanks or light-weight torpedoes on external carriers, with flares and marker floats launched via a chute in the rear cabin. A heavy-duty cargo hook could be rigged under the fuselage to lift loads using slings. A power winch for rescue work was mounted above the cabin door. Deployable floats attached to the front wheels would inflate in the event of ditching at sea. On 6 September 1962 the first RAN Wessex flight took place at Yeovil, England; near the Westland Factory. Each aircraft was subsequently test flown in the United Kingdom before being partially dismantled and shipped to Australia. The first Wessex to be assembled in Australia conducted its ground run at the Naval Air Station – Nowra on 19 November 1962 and was test flown the following day. Following assembly and a test flight the Wessex helicopters were assigned to 725 Squadron for training of aircrew. 817 squadron was commissioned at Nowra on 18 July 1963 to become the main ASW squadron. By late 1963, 725 Squadron had nine Wessex helicopters and 817 had ten. In late 1963 the Wessex helicopters were embarked in Melbourne for the first time. With its advanced ‘dunking sonar’ and ability to hover for lengthy periods, the Wessex gave the RAN a potent night-and-day anti-submarine capability, which when operating with the Fairey Gannet provided wide-area ASW coverage. The Wessex’s generally worked as a team of two during their search for submarines. On 10 February 1964 the destroyer HMAS Voyager was lost in a tragic collision with Melbourne, off Jervis Bay NSW. Wessex crews were recalled to Nowra and two search and rescue aircraft was quickly scrambled. The Wessex helicopters flew throughout the night and although only two rescues were carried out by them, many survivors were located by the helicopters and rescue vessels directed to them. The ability to carry out over the water low level approaches in darkness was a capability that saved many lives that night. Three Wessex helicopters crashed during training flights during 1964 - 1967; all in the Nowra area. In all three cases the aircrew survived, but the Wessex was damaged beyond repair. During the 1960s Australia’s commitment to the South East Asia Treaty Organization (SEATO), and the Far East Strategic Reserve, meant that Melbourne and other RAN ships conducted regular exercises with the Royal Navy, US Navy, Royal New Zealand and regional navies. During these the Wessex helicopters demonstrated a high level of anti-submarine capability weapon. Using a combination of shipboard systems, the Wessex sonar, and fixed-wing aircraft a high level of protection from submarine attack was provided to the task groups. Four Wessex helicopters were also assigned to the fast troop transport HMAS Sydney during her ‘Vung Tau Ferry’ runs to South Vietnam carrying troops and equipment to the war zone. In 1968, 23 of the original Wessex helicopters were upgraded to become the Wessex 31B; one aircraft retaining its 31A configuration. This involved fitting the more powerful Mk 165c 1600 shaft horse power Napier Gazelle engines for increased load and performance; a new ASQ-13 sonar; improved navigational aids and radar. These helicopters became known as the Westland Wessex 31B, and were easily identified by the large dorsal hump behind the main rotor and the AN/APA 161 radar for station keeping in ASW operations. By March 1969 all 23 helicopters had been upgraded. Left: Two Westland Wessex 31A's operating from the Naval Air Station at Nowra. Right; The Wessex 31 was also a very good utility helicopter for search and rescue tasks - here a Wessex is rescuing a rock fisherman on the South coast of New South Wales.